Happy Day to me! 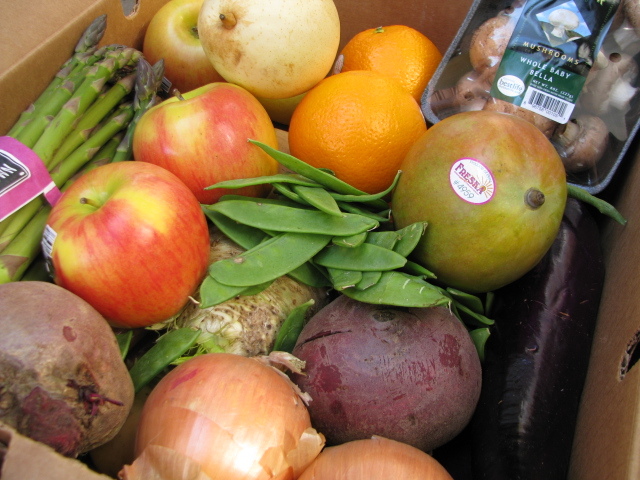 Look at this beautiful box of fresh produce E.B. brought to us. Most of it has been eaten already - no surprise there. Ada plowed through most all the fruit in a couple days. Those snow peas made a delicious appetizer with a little bulgogi gravy and sriracha sauce. The mushrooms will hopefully get posted this week. 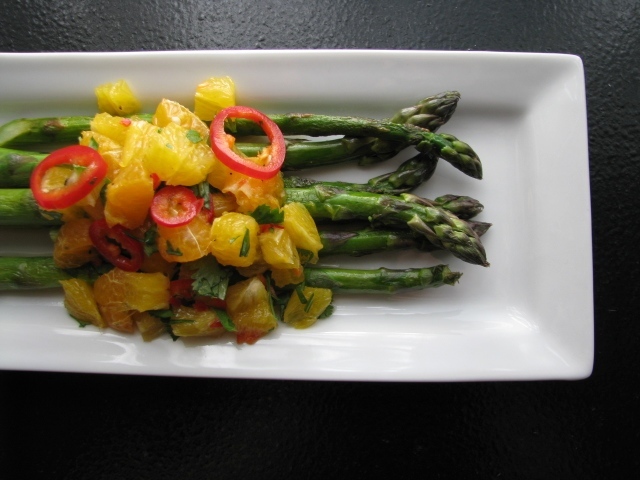 But the first recipe I will share was made with the asparagus. The trick to this recipe? You need to get it all chopped up and in the bowl with the pepper before the kids eat all the pieces! I used prosciutto. I'm sure substituting bacon will work just fine. I then used a combination of oranges and tangerines because there weren't enough oranges after Ada ate all the pieces! It still turned out pretty great. I also was too lazy to go outside and fire up the grill so I pan fried the asparagus after cooking the bacon...think that's probably how I'm gonna do this going forward - really made this dish quick to prepare - unless of course there are other things to be grilled - in that case it ALL goes outside. peel and chop all the fruit and place in a bowl. make sure you also squeeze all the end pieces to get all the juice out of them and add that to the bowl. slice a few rounds from the pepper and add to the orange mixture. chop the rest of that pepper up and add to the bowl. add the honey, a couple turns of salt and pepper. mix all this together then set aside and let all those flavors mingle. chop and crisp the prosciutto. remove from the pan to a plate lined with a paper towel. drain most of the fat out of the pan then add the asparagus. cook over medium heat and keep rolling them around until some char marks start appearing and until all the little bits of prosciutto have been picked up. it should only take a few minutes for them to heat through. if you like your vegetables a little softer - add about a 1/4 cup of water and cook them a little longer. chop about a 1/4 cup cilantro and add most of it to the orange mixture. plate, garnish with remaining cilantro.